A beautifully restored 1957 Porsche 356A Carrera Speedster GS/GT (estimate $1,200,000-$1,300,000) is the early lead car the Bonhams Goodwood Festival of Speed classic car auction 2017. A 1973 Porsche 911 2.7 Carrera RS Lightweight (estimate $960,000-$1,100,00), considered by many the ultimate 911, will also be offered in the Goodwood sale in England at the end of June. Bonhams will be celebrating all things fast at its Goodwood Festival of Speed sale will be held on 30 June 2017 in Chichester in the south of England. This popular fast-car festival is traditionally accompanied by one of the most-important classic car auctions of the year. In 2013, Bonhams set the Goodwood Festival of Speed auction record when a 1954 Mercedes-Benz W196R Formula 1 single-seater racing car driven by legendary five-times world champion Juan Manuel Fangio fetched a record breaking £19.6 million ($29.65 million). At the time it was the most-expensive car ever sold at auction and nearly doubled the previous record price. Porches have been selling very well at recent auctions despite the high numbers of car available. Ten Porsches are set to be offered at the Bonhams Goodwood Festival of Speed sale 2017 with two particularly rare and significant examples leading the pack. Whilst the 356 Speedster has quite rightly become one of Porsche’s most desirable models, the 1957 Porsche 356A Carrera Speedster GS/GT (£900,000-1,000,000) is in a league of its own. 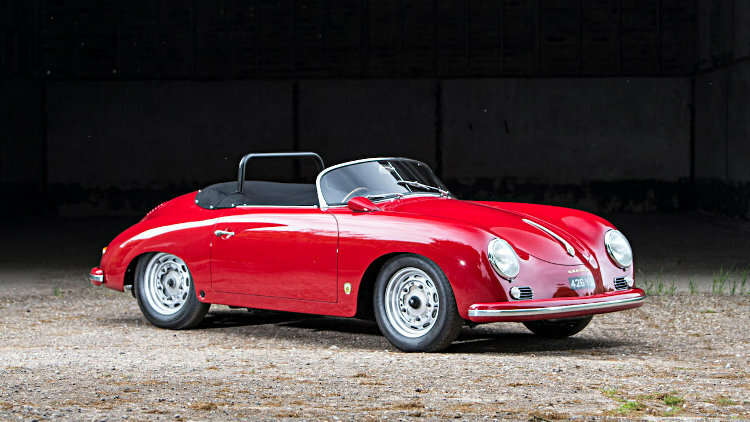 Between 1955 and 1959, just 152 or so Carrera Speedsters were produced, and this example is one of only three configured to right-hand drive. Originally finished in the striking ruby-red it sports today, the motor car offered was delivered new to Australia where it had three owners before being laid up in a barn for several years. In 1982, the next owner restored the car as a silver GT using the engine from the fourth GT speedster to ever leave the Porsche production line. In 2014, the car was subjected to a meticulous restoration to bring it to its current exceptional condition. With a string of awards under its belt from concours across the world, this has to be one of the most desirable Porsche 356s available. The origins of the Carrera Speedsters date back to 1954, when a young engineer at the Porsche competition department decided to place a 4-cam Carrera engine in to a modified 356 Coupé. The vehicle then went on to win one of the toughest rallies in Europe, the Liège-Rome-Liège, and Porsche realised that they had something particularly special. Dr. Ernst Fuhrmann, a prodigal young engineer at the Stuttgart factory was the star behind the Carrera Speedster. The 1,500cc engine he designed had dual ignition, four overhead camshafts and aluminium pistons, cylinders and cylinder heads. The crankshaft rotated in roller bearings, and the engine was capable of producing almost 110bhp, double the power of the traditional 1,500 push-rod engine. His ingenious design allowed the car to reach 120 mph and a 0-60 mph time of 11 seconds. Debuted at the 1955 Frankfurt Motor Show, the Carrera name is taken from the famously gruelling Mexican road race at which Porsche had previously dominated the 2-litre class. Bonhams will also offer what is widely considered to be the ultimate 911. The 1973 Porsche 911 2.7 Carrera RS Lightweight (£750,000-850,000) is an impressive example of Porsche’s legendary engineering prowess. Only 111 were ever delivered to the UK in right-hand drive configuration, of which just 19 were Lightweights such as the model offered here. The Lightweights, such as this, were generally bought by the most devoted of sporting drivers for use on the road, or by fully-fledged racing drivers for track use. All superfluous items were removed, including rear seats, armrests and even the clock in a bid to shed weight. Porsche managed to lose massive 100 kg from the car, improving the handling, acceleration and braking of what is already a seriously impressive machine. Originally sold in Belfast, the car took part in several Irish rallies including the Donegal Rally. Its sporting career continued after it moved to the UK in 1974, a year during which it took part in no fewer than 6 rallies. A two-year restoration was carried out in the late 1990s, restoring it to its original specification, and an engine rebuild took place in 2000. The rarity and importance of these two machines cannot be underestimated – both are outstanding, right-hand drive examples of two of the most desirable models ever created by Porsche, and would make impressive additions to any serious classic car collection.